A few months ago, I posted about the beauty and versatility of our Low Tech LED Drapes. These beautiful sheer White Voile Drapes with internal white LED lights are just gorgeous and can be used for a variety of events, from weddings to rock concerts. One of the recent projects that I mentioned in the post was the Marilyn Manson Tour. Originally selected for the Spring U.S. tour only, the drapes were so impressive that the rental was extended through the Fall U.S. tour and even taken overseas to be used as part of the set for the European tour as well. I had posted one photo that we got of the drapes in use by Marilyn Manson, but we have since discovered a number of other photos on Flickr. We’ve compiled them into a Flickr Gallery – we’d love for you to check out the gallery and see for yourself how versatile these drapes can be. Recently our President Megan Duckett and General Manager Lynda Vaughn had the distinct honor of being invited to attend the Dell Small Business Think Tank here in Southern California. It was an interactive dialogue on how local small businesses and entrepreneurs plan to grow and succeed this coming year, and what they need most from the organizations that support them so that they aren’t always being overshadowed by national issues. It was a fascinating workshop for those who attended in person and live online (via twitter and Storify), and I was able to get a first-hand account of the experience from Megan herself which I know our readers will also find very interesting. Thanks for sharing your day with us, Megan! What kind of companies were represented, and how many attended? Were there any familiar faces/companies/vendors in attendance? This was a really targeted group of local small businesses, with an attendance of around 35 people. Everyone was from the Los Angeles area and were mostly long-time established family owned and operated businesses. What made this group of particular interest to me was that there were actually other local manufacturers in attendance. Local manufacturing seems to be at an all-time low – with so much going off shore for production. Worse yet in a small business environment the owners usually are involved in running the day to day – making it hard to get away and attend this type of event. It was great to see such a good turnout. A local canvas boat cover manufacturer who is right down the road from us in Long Beach was there – it was great to meet and share “best practice” stories with one another, especially since our fields are very similar. What did you end discussing at this meeting? The style of the meeting was a “think tank” conversation – where there is a moderator and then the group all participates actively. It’s a really great way to get everyone involved. It only works well when the group is small and targeted – and the subject has to strike a chord with everyone on the panel. It was great – we were all there because we had something to bring AND something to learn! What were everyone’s biggest concerns/issues with being a successful small business owner? Some of the biggest concerns that continue to haunt small businesses despite a “vision of a better economy on the horizon,” included HR tasks and tactics. How to hire, how to retain good talent, how to position your business so that it is attractive to new employees — those are all of utmost concern to everyone nowadays. What makes a place “great” to work at, and how to structure pay scales and pay raises in uncertain economic times, is also of great concern and consideration for all business owners in today’s economy. Any other points of interest that you would like to mention? Dell Computers did a great job of bringing an all-around open discussion to the group – it was particularly great as they had plenty of technology advice available to us as needed – but it was not specifically about technology. In small business our needs are so much rounder than just IT. Let’s face it – the IT is no good if you don’t have the resources to purchase or implement it. Let alone keep it up to date and running! I’m really looking forward to the next event that they present locally here in LA. I am also a member of DWEN (Dell Women’s Entrepreneur Network) and a supporter of their Entrepreneur In Residence Program, which are both really wonderful organizations to belong to, encouraging business owners – especially women business owners — to be as successful as they possibly can be! Sometimes starting with the basics of stage design can create the most dazzling and breathtaking visions you could ever imagine. Rent What? Inc.’s beautiful Delightably White Series of theatrical rental drapes is a fantastic place to start when you are looking to create unique and gorgeous staging for your concert, production, or any other special event. With everything from our alluring sheer White Voile Legs and Swags, to our striking and versatile White Supervel pleated backdrops, to our phenomenal and unforgettable White China Poly Silk and Ivory Satin Austrians, you have a huge selection of drapes to choose from that will really wow your audience. These drapes all light beautifully and dramatically, and can help you create an exciting look for your event that has never been seen before. We absolutely love it when we get to see our drapes out in the world, dazzling our clients’ visions and impressing crowds everywhere. We also love it when we get to see our drapes get utilized in a way it all began— in a good old fashioned Rock ‘n Roll concert! 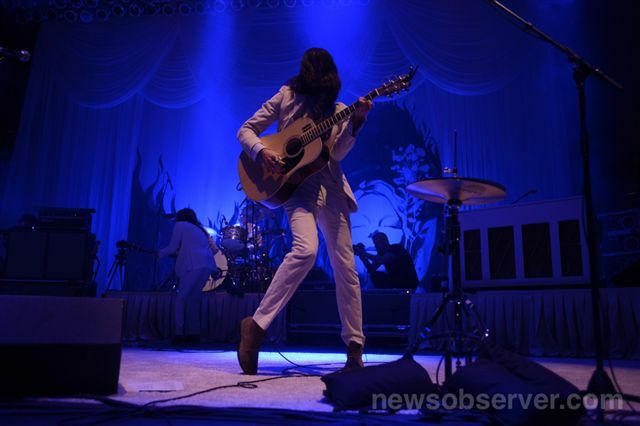 Very recently some of our gorgeous White Voile Specialty Rental Drapes were used in a very notable and effective way by indie folk-pop group The Avett Brothers. Using White Voile Legs and Swags to help create a truly rockin’ look from our Delightably White rental drape collection, these drapes were layered and lit up to be as ultra-cool as the band playing in front of them. The NewsObserver.com showcased the band beautifully, and ultimately showcased our specialty rental drapes too. 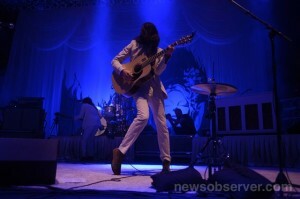 Using these white voile drapes for their New Year’s Eve show, The Avett Brothers were able to create the extraordinary look they were going for. Next time you want to create an exclusive and memorable look for your special event, try some rental drapes from our Delightably White Series, and see how remarkable your staging can become! Want to see more photos of these drapes in action at The Avett Brothers New Years Eve concert? Check out our Flickr gallery. As regular readers know, almost every year we create a new Sew What? Tee Shirt. Designed by the fabulously talented John Rios, each has a unique “Rock ‘N’ Roll” inspiration. I featured a couple of the shirts on this blog. Heavy Metal was the theme of 2009’s shirt, whereas in 2010 there were two designs, Rock N Roll and Superhero. Recently, I told you how proud we are that all of the products that we manufacture are Made in America, as are most of the fabrics that we use and most of the theatrical equipment and supplies that we sell. 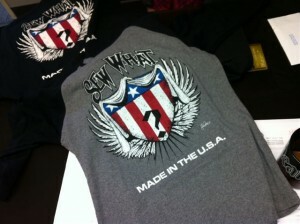 This became our inspiration in the design of the 2012 Sew What Tee Shirt, again designed by John Rios. John took the theme of Made in America and combined in with elements of Rock N Roll and the iconic Sew What question mark. I love this shirt! It is a great design for both men (printed on a traditional tee shirt) and women (printed on a raglan sleeved shirt). 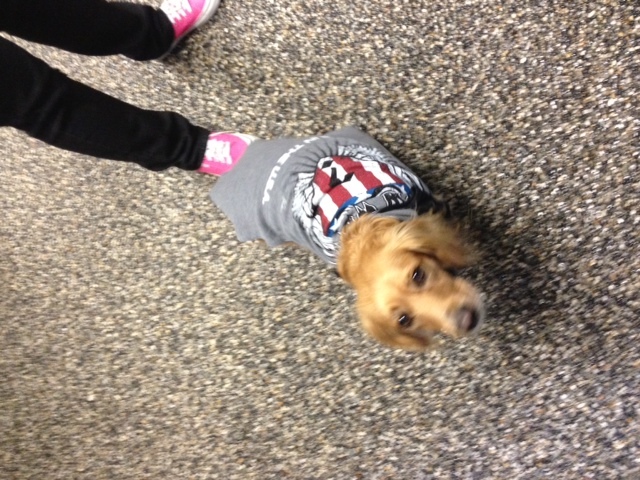 Crispin likes it, too! As a Sew What Sales rep, recently I was contacted by the production team for music star Solange (sister of Beyonce). It was late on a Wednesday, and the production team was in a panic as they needed specialty soft goods to be delivered to New York City by the upcoming Monday, when Solange would be making an appearance on Live with Jimmy Fallon. Originally the client asked us to digitally print artwork representing a variety of African prints and then sew the digitally printed pieces into stage skirts and backdrops. Unfortunately, the time crunch was too great for the production team – trying to create new artwork files (based on several image concepts) and get artist approval of the images in 24 hours just wasn’t possible. So on to Plan B. On that Thursday, a production team representative made a quick run out to Downtown LA to select fabric in a variety of multi-colored cotton African-style prints. The fabric was then taken directly to a flameproofing company for rush treatment. We got the fabric from the flameproofers late Friday afternoon, our dedicated sewing staff came in on Saturday morning to manufacture the stage skirts and backdrops, and we handed the pieces off to our client by 1:00 pm Saturday to make a flight out to New York. The pieces made it to New York City in time for the show on Monday and looked great. Sew What?, Inc. often handles last minute rushes for artist tours and special appearances such as these, and we appreciate the confidence our clients have in our premium products and service. We aren’t always able to accommodate extreme rush projects such as this, but we always give it our best shot. I’m glad that we were able to come through for this project.